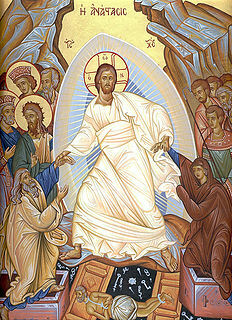 In addition, Orthodox churches have a custom of abstaining from eggs during the fast of Lent. The only way to keep them from being wasted was to boil or roast them, and begin eating them to break the fast. As a special dish, they would probably have been decorated as part of the celebrations. Later, German Protestants retained the custom of eating colored eggs for Easter, though they did not continue the tradition of fasting. Eggs boiled with some flowers change their color, bringing the spring into the homes, and some over time added the custom of decorating the eggs. Many Christians of the Eastern Orthodox Church to this day typically dye their Easter eggs red, the color of blood, in recognition of the blood of the sacrificed Christ (and, of the renewal of life in springtime). Some also use the color green, in honor of the new foliage emerging after the long-dead time of winter. The Ukrainian art of decorating eggs for Easter, known as pysanky, dates to ancient, pre-Christian times. Similar variants of this form of artwork are seen amongst other eastern and central European cultures. The idea of an egg-giving hare went to the U.S. in the 18th century. Protestant German immigrants in the Pennsylvania Dutch area told their children about the "Osterhase" (sometimes spelled "Oschter Haws"). Hase means "hare", not rabbit, and in Northwest European folklore the "Easter Bunny" indeed is a hare. According to the legend, only good children received gifts of colored eggs in the nests that they made in their caps and bonnets before Easter. The Oxford Dictionary of English Folklore however states "... there is no shred of evidence" that hares were sacred to Ēostre, noting that Bede does not associate her with any animal. ^ Cross, Gary (2004). Wondrous Innocence and Modern American Children's Culture. Oxford University Press. ISBN 978-0195348132. ^ Franck von Franckenau, Georg (1682). Disputatione ordinaria disquirens de ovis paschalibus / von Oster-Eyern. Satyrae Medicae. XVIII. Heidelberg. p. 6. Retrieved 18 July 2013. ^ a b Chapman, Chris (2004). "What does the Symbol Mean?". Three Hares Project. Retrieved 20 April 2014. ^ Marta Powell Harley (1985). "Rosalind, the hare, and the hyena in Shakespeare's As You Like It". Shakespeare Quarterly. Shakespeare Quarterly. 36 (3): 335–337. doi:10.2307/2869713. JSTOR 2869713. ^ "Sir Thomas Browne (1646; 6th ed., 1672) Pseudodoxia Epidemica III:xvii (pp. 162-166)". ^ "Three Hares as representation of the Trinity". Threehares.blogspot.com. 2006-02-25. Retrieved 2010-06-29. ^ Heller, Steven (April 2014). "Seeing Rabbits". Academic Search Complete (Vol. 68 Issue 2). ^ Martinez-Gomez, Margarita (September 2004). "Overlapping litters and reproductive performance in the domestic rabbit". Academic Search Complete (Vol. 82 Issue 4). Physiology & Behavior. ^ Lumpkin, Susan; John Seidensticker (2011). Rabbits: The Animal Answer Guide. JHU Press. ISBN 0-8018-9789-0. p. 122. ^ Snodgrass, Lucie L. (March 2005). "DYED IN Tradition". Academic Search Complete (Issue 329). Vegetarian Times. ^ Hallett, Vicky (March 31, 2003). "Egg-cellent art". Academic Search Complete (Vol. 134 Issue 10). U.S. News & World Report. ^ "Gruß vom Osterhasen: Oschter Haws Song : GERMAN WORLD MAGAZINE". Germanworldonline.com. 2011-04-23. Retrieved 2013-03-31. ^ Attenborough, Sir David (Presenter) (April 12, 1993). Wildlife on One Easter Special Shadow of the Hare (Television). United Kingdom: BBC. 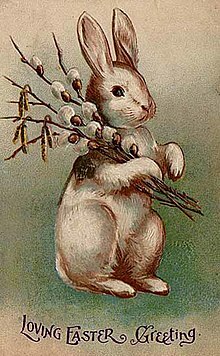 Wikimedia Commons has media related to Easter Bunny. Charles J. Billson. "The Easter Hare". Folk-Lore. Vol. 3, No. 4 (December 1892). Easter eggs, also called Paschal eggs, are eggs that are sometimes decorated. They are usually used as gifts on the occasion of Easter. As such, Easter eggs are common during the season of Eastertide. The oldest tradition is to use dyed and painted chicken eggs, but a modern custom is to substitute chocolate eggs wrapped in colored foil, hand-carved wooden eggs, or plastic eggs filled with confectionery such as chocolate. However, real eggs continue to be used in Central and Eastern European tradition. Although eggs, in general, were a traditional symbol of fertility and rebirth, in Christianity, for the celebration of Eastertide, Easter eggs symbolize the empty tomb of Jesus, from which Jesus resurrected. In addition, one ancient tradition was the staining of Easter eggs with the colour red "in memory of the blood of Christ, shed as at that time of his crucifixion." This custom of the Easter egg can be traced to early Christians of Mesopotamia, and from there it spread into Russia and Siberia through the Orthodox Churches, and later into Europe through the Catholic and Protestant Churches. This Christian use of eggs may have been influenced by practices in "pre-dynastic period in Egypt, as well as amid the early cultures of Mesopotamia and Crete". Ēostre or Ostara is a Germanic goddess who, by way of the Germanic month bearing her name, is the namesake of the festival of Easter in some languages. Ēostre is attested solely by Bede in his 8th-century work The Reckoning of Time, where Bede states that during Ēosturmōnaþ, pagan Anglo-Saxons had held feasts in Ēostre's honour, but that this tradition had died out by his time, replaced by the Christian Paschal month, a celebration of the resurrection of Jesus. The European hare, also known as the brown hare, is a species of hare native to Europe and parts of Asia. It is among the largest hare species and is adapted to temperate, open country. Hares are herbivorous and feed mainly on grasses and herbs, supplementing these with twigs, buds, bark and field crops, particularly in winter. Their natural predators include large birds of prey, canids and felids. They rely on high-speed endurance running to escape predation, having long, powerful limbs and large nostrils. A pysanka is a Slavic egg, decorated with traditional folk designs using a wax-resist method. The word pysanka comes from the verb pysaty, "to write" or "to in scribe", as the designs are not painted on, but written (inscribed) with beeswax. Egg rolling, or an Easter egg roll is a traditional game played with eggs at Easter. Different nations have different versions of the game, usually played with hard-boiled, decorated eggs. An Easter bonnet is any new or fancy hat worn as a Christian headcovering on Easter, by tradition. It represents the tail-end of a tradition of wearing new clothes at Easter, in harmony with the renewal of the year and the promise of spiritual renewal and redemption. An Easter basket is a special basket used in Easter celebrations. Easter baskets are typically filled with Easter eggs, food, toys, or other gifts depending on one's culture. Egg tapping, or also known as egg fight, egg knocking, egg pacqueing, egg boxing, egg picking, egg chucking, or egg jarping is a traditional Easter game. In English folk traditions, the game has variously been known as "shackling", "jarping" or "dumping". Hop is a 2011 American 3D live-action/computer-animated fantasy comedy film produced by Illumination Entertainment and released by Universal Pictures. Directed by Tim Hill and produced by Chris Meledandri and Michele Imperato Stabile. The film was released on April 1, 2011, in the United States and the United Kingdom. Hop stars Russell Brand as E.B., the Easter Bunny 's son who'd rather drum in a band than succeed his father as the Easter Bunny; James Marsden as Fred O'Hare, a human who is out of work and wishes to become the next Easter Bunny himself; and Hank Azaria as Carlos, an evil chick who plots to take over the Easter organization. It was released on DVD and Blu-ray Disc on March 23, 2012, in Region 1. Rabbits and hares are common motifs in the visual arts, with variable mythological and artistic meanings in different cultures. The rabbit as well as the hare have been associated with moon deities and may signify rebirth or resurrection. They may also be symbols of fertility or sensuality, and they appear in depictions of hunting and spring scenes in the Labours of the Months. A German tradition of decorating trees and bushes with Easter eggs is known as the Ostereierbaum, or Easter egg tree. A notable example is the Saalfelder Ostereierbaum in Saalfeld, Thuringia.